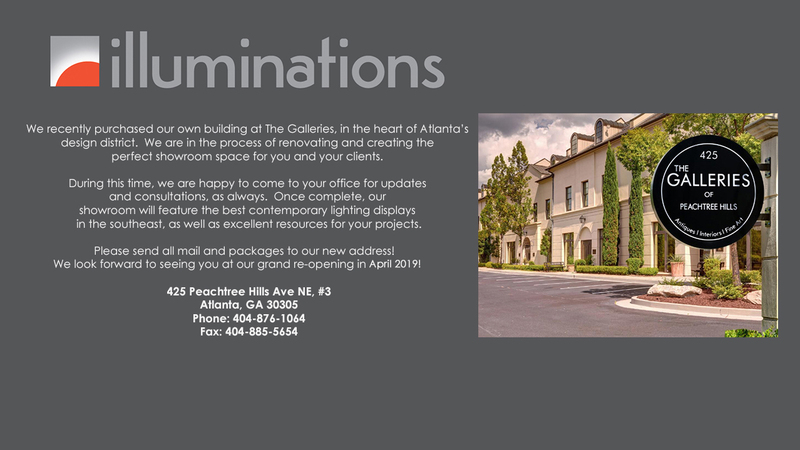 Illuminations Lighting began a new chapter in 2019 with the purchase of our own building at The Galleries, in the heart of Atlanta’s design district. We started the business in 1990 with the opening of our first showroom on Monroe Drive in Midtown Atlanta. Our objective for the last 29 years has been to provide the interior design community in the Southeast with the best European and domestic contemporary lighting available, collaborating with many of the top architects and designers on a range of projects. We attribute our success to both the quality of the lighting that we offer and to our commitment to provide our clients with the most outstanding service possible. We want to share our knowledge and experience in lighting and believe that we are a valuable resource for our design community. We look forward to working with you and to being your resource for contemporary lighting. While our new showroom is being renovated, we are available to come to your office for consultations, as always. For additional information on any of our lines please call us at 404-876-1064 Monday–Friday 10-6 or email us at sales@illumco.com with your request. We look forward to seeing you at our grand re-opening in April 2019!